This document applies to SAP Business One 9.1. SAP Business One application forms, be it a master form or a transaction form includes number of fields, tabs and options to support varied kind of business needs. Usage of these fields, tabs and options varies from user to user which depends upon the user profile. Also to support some out of the box requirement, companies do some customization and add user defined field too. In order to cater to this scenario, The Configurable UI Template comes in handy to adjust the UI as per the usage and requirement of the user. This helps the companies to not to display or control the information not relevant to the user and make the UI compact and tidy. Press Ctrl + A. In the name field enter a unique name for the template. In the description field, enter a meaningful description explaining the template. 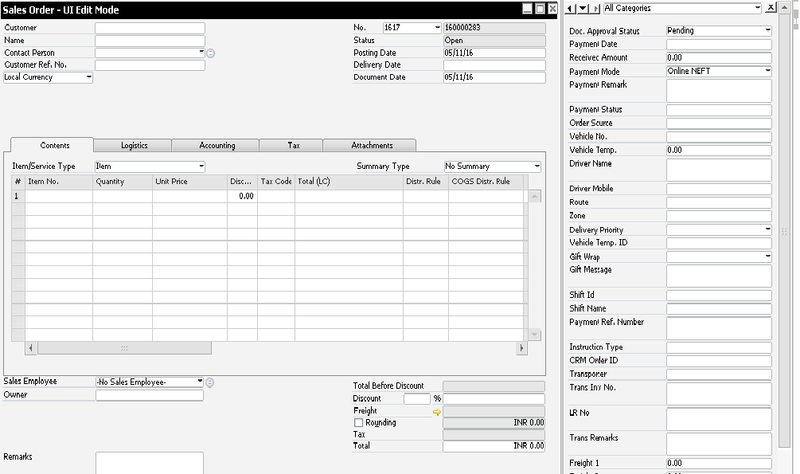 On the forms tab, click on the drop down menu and select to form to be changed. You can include multiple forms too. Choose Administration –> Utilities — UI Configuration Template. Select the desired form by clicking on the row header. Select the required field to make changes. After selecting the field, it gets surrounded by thin black border along with related fields too. From the context menu, if you select Hide, you will get following result. Likewise, you can try different options from the context menu and see the effect yourself. To set the fields to Read – Only mode, select the Disable option. To Move the fields from one area to another area, just use Drag & Drop technique. To Align the fields, use appropriate options like Top, Bottom, Right & Left. To Move the user defined field to the header area of a document, click on the editable part of the field and drag it on to the form. Once done, Right Click in the empty area of a form and select Save from the context menu to save your changes. Click on Copy To button. System will list the available forms. 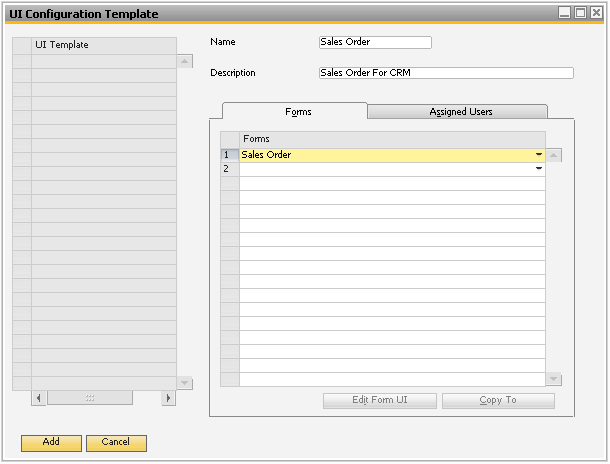 Select the appropriate one and click On Ok.
You can assign a UI template as a default template at company level. You can assign one or more UI templates to each user. 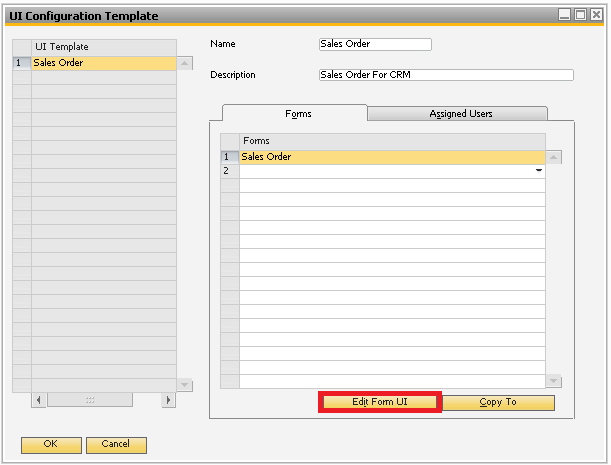 If multiple templates that include the same form are assigned to a given user, the first template assigned to the user is considered as the default template for this user. 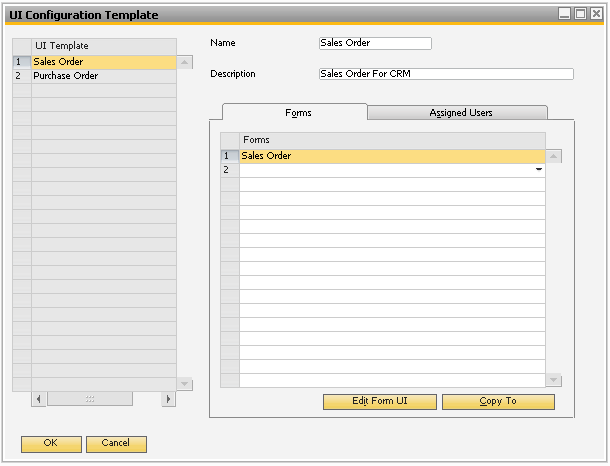 All users can set their own default template for a given form. 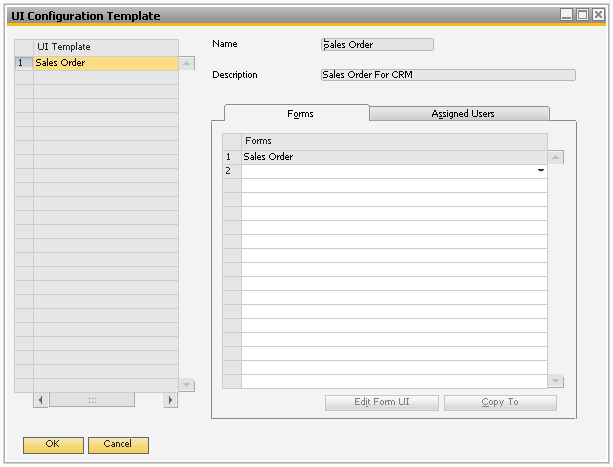 From the UI Template list, select the UI template you want to assign to selected users, and click the Assigned Users tab. Select the users to whom you want to assign the template and hit Update button. 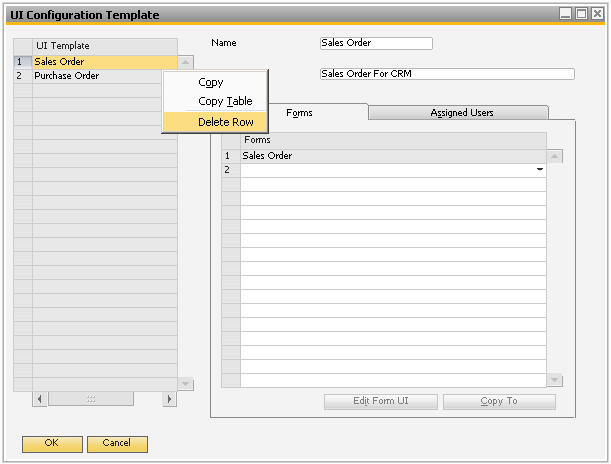 Select the desired UI template and Right Click and select Delete Row option from context menu. A warning message appears stating the deletion is irreversible. To complete the deletion, choose Yes. 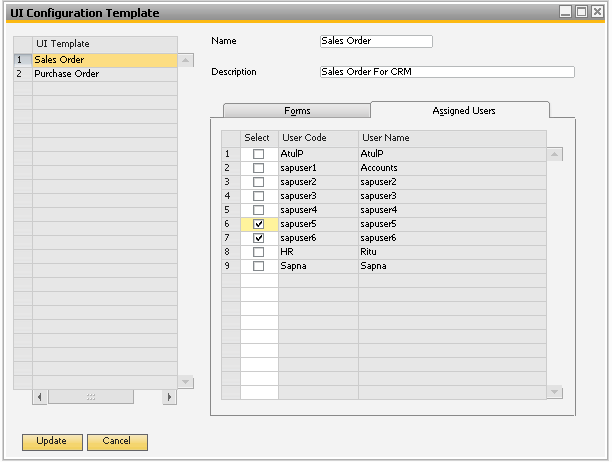 Choose Administration –> Utilities –> UI Configuration Template. Select UI template you want to un – assign. On the Assigned Users tab, deselect the users from whom you want to un – assign the template. A warning message appears stating that all personal settings made by these users to the unassigned UI template will be deleted. To complete the assignment, choose Yes. Thanks Jesus for sparing time to go through it and appreciating. I created a UI Template and wanted to test it. When I select the UI Template drop down, the newly created UI Template does not appear. When I attempt to assign it in the UI temple tool, I am not a listed user…. 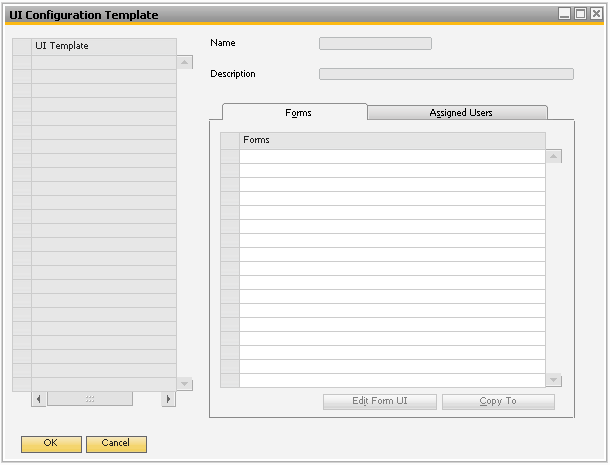 In the UI configuration template window are you able to see the list of configured UI Templates in the left pane along with the list of forms and assigned users. 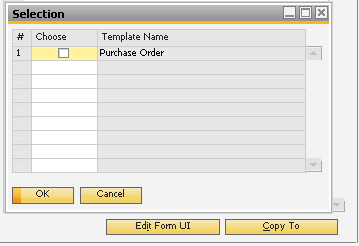 On selecting the configured UI template, the forms pane should display the forms and assigned users should get selected. Please check, in the assigned users tab whether you have assigned the users to those templates. Sorry to have responded late. I tried this and the template is getting assigned to the superuser as well. In fact from the superuser’s login I assigned the template and immediately without logging off an re logging I opened a form and got to see the template attached in the form setting. I can indeed see the list of templates along with the list of forms and users. My goal was to test the new template with our systems team. I am unable to assign the Template to my team members because there not on the user list. I fear it is because they are super users. I think ots not a mature feature because i designed a UI template and assign it to user whenever the user log out and at re login Ui is disturbed. It should not happen. Because most of the transaction screens in our set up are controlled on this way. Only thing is, the UDFs are not covered in this. You need to separately control them through individual user login. Also, if you are not comfortable with this utility, there is a option in user Screen. “Copy Form Setting”. You can use that too.